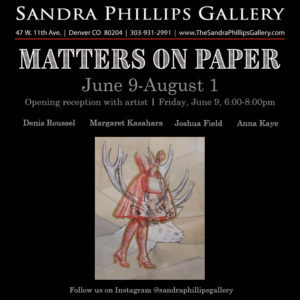 I’m excited to have 18 recent drawings included in “Matters on Paper” at Sandra Phillips Gallery in Denver from June 9 – August 1. The exhibition will include work on paper by Denis Roussel, Margaret Kasahara, Joshua Field, and Anna Kaye. Please join us for the opening reception on June 9 from 6-8pm.